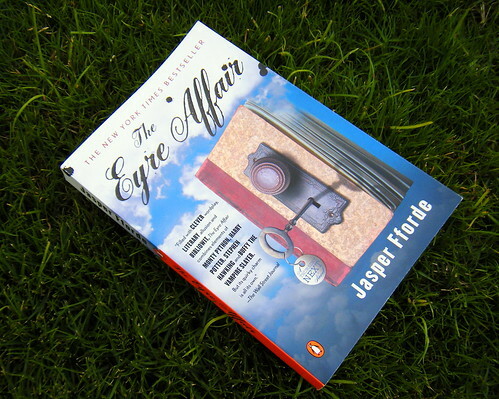 A quick, fun read leaving you with a great admiration for Fforde’s imagination and cavalier literary liberties. Thank you to Aaron for a terrific recommendation, succeeding in getting me back to sprinkling my normal business-book diet with some lighthearted fiction. BrontÃ«'s novel, Thursday is faced with the challenge of her career. Love being able to add ‘bibliowit’ to my vocabulary (compliments to the WSJ review on the book jacket) and I keep thinking that this was the perfect book for me to recommit to reading in 2009 precisely because of all of Fforde’s “literary allusion and bibliowit.” I was left with a list of books, mostly classics, that I haven’t read since college and have forgotten so much of, which I’d love to reread again now. Then I could trace my calendar to read The Eyre Affair again at the end of the year, to newly appreciate some references that probably flew right past me. As for the “clever wordplay,” the naming and characterization of Braxton Hicks really cracked me up the most. Every woman who has ever carried a child will understand. View all my reviews (at Goodreads). Mana‘o on a Virtual Bookshelf. Postscript: If you are a blogger, the bones for this post came from a great “post this review to your blog” option at GoodReads, a social network for readers that will give you even more incentive to read more this year with me too!